A review copy was provided to me by the publisher in exchange for an honest review. All opinions are my own. Joe Abercrombie’s Young Adult series comes to a close in this final book of The Shattered Sea trilogy. A fine ending if there ever was, though I’m afraid I will sound a lot more negative than I mean to be in this review. It’s just that compared to the incredible showing of the two preceding novels, Half a War may just trail just a tad behind in awesomeness. Still, you can be sure this third book is not to be missed. Once again, the torch has been passed on to a group of new point-of-view characters. Koll will be no stranger to readers who have been following the series; the boy with a talent for woodcarving who journeyed with Father Yarvi in Half the World is now serving as an apprentice to Gettland’s minister. Princess Skara is a new character, the lone royal survivor of Throvenland after a new foe named Bright Yilling came in the night to kill and burn everything she ever loved. Raith is the sword-bearer of the king of Vansterland, who arrived with his lord to a meeting between the three nations to discuss plans to topple the High King and his ruthless advisor, Grandmother Wexen. The stage is set for a war to end all wars, and Joe Abercrombie does not disappoint. Still, I couldn’t help but feel something was missing as I was reading this, and it took me a while, but I think I finally figured out what it was: the characters. Protagonists Koll, Skara and Raith were all great, but they paled in comparison to the personalities that came before them. Yarvi charmed us in Half a King while Thorn and Brand won us over in Half the World, but they’ve had their turns as lead characters and are now returning to Half a War as supporting cast only. Or, that is how it should have played out. What actually happened was this: Koll, Skara and Raith may be the three POV characters in this book, but they really don’t feel like the stars. Almost all of the major outcomes were shaped by the main protagonists from the previous books, like Yarvi and Thorn. Furthermore, it’s the power-players like Father Yarvi, King Uthil, Grom-il-Gorm and Mother Scaer who seem to make all the decisions and influence the course of this story, leaving Koll, Skara and Raith outclassed, outgunned, and outnumbered. Simply put, the three young ‘uns feel a bit like interlopers at the adults’ table, sitting in as mere guests for the finale of this epic tale. Though I was initially ecstatic to discover Koll would be a point-of-view character, I wasn’t prepared for his limited role in the greater scope of events. Reporting on everything Father Yarvi does seems to be his major purpose, because the author couldn’t use Yarvi as a POV character himself. Skara had more initiative, but as a main protagonist, she still felt pretty shallow and unimportant until the very end. Finally, there’s Raith, who still feels like a big question mark. Rough, tough, and a fighter to the core, he was like the male version of Thorn’s character from Half the World but without her complexity. Three perspective characters also felt like a bit much, compared to the relative simplicity of Half a King where we only had Yarvi’s POV to follow, and in Half the World where the chapters alternated between Thorn and Brand. In Half a War, Koll, Skara and Raith felt like they were constantly jostling each other for more page time, and poor Raith typically lost out with very short chapters, which probably explains why he is the least developed of the three. In addition, when the three characters are separated, we bounce around the world a lot, making it very easy to confuse where we’re supposed to be, since no time is really taken to establish context. The result is that the book felt a tad rushed, with a couple of the characters’ storylines lacking closure. I’m also a little skeptical of the ending, which felt a little deus ex machina, and I say this as someone who usually doesn’t notice these things. Still, if you ask me whether or not Half a War is worth reading, my answer would be ABSOLUTELY. It’s just hard not to focus on the negatives in this book when the previous two were close to perfection, but that doesn’t mean I didn’t have a blast with the story. Compared to its predecessors, this book felt a bit rushed with characters that aren’t Abercrombie’s best, but the overall arc finishes with a bang and I wouldn’t hesitate to recommend the trilogy. 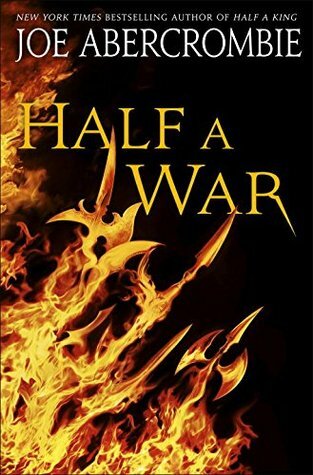 Half a War might not be my favorite of the series, but it was worth getting to that epic conclusion, so fans of the first two books will definitely want to pick this up. It might just might surprise you in a big way. Sorry to see it wasn’t tht good but in a whole it sounds good too. It’s always a bit complicated with book 3. I didn’t know that it was out… I remember seeing the others a lot on blogs. Book 3s are tricky. He built up the series a lot over the course of it, so maybe my expectations were too high, but this just felt slightly forced and rushed. Oh yeah, definitely finish the trilogy! I couldn’t resist either. Oh yes, do give this trilogy a read! Half A King is excellent, loved that book. And yeah, too bad for me this one didn’t end with a bang like his First Law Trilogy in which I thought the third book was actually the best! I felt the opposite with this one, unfortunately. But, ah well it happens. I intend to read this one, but I’ve lowered my expectations after reading your review. I hope you’ll enjoy it more than me! I think the biggest thing that irked me about this one was the ending. Oh! I hadn’t thought about Raith being like that male version of Thorn, but yeah, I can see that. Agree with pretty much everything you said 🙂 Great review! Ugh, I couldn’t get the idea of Raith being the male version of Thorn out of my head! They are like THE same, and the two of them even admit it as much in the book, lol. I’m really late with commenting because I wanted to write my review before reading yours! But yes, you said it perfectly – this book feels like the POV characters are there just to show what Yarvi’s been doing. I really disliked the conclusion to Abercrombie’s The First Law trilogy and while this one is a bit better, it still wasn’t as good as the first two parts. I also can’t believe he killed the only good character in the story. What is up with that? Ok, I know he’s Lord Grimdark, but still… Eh.